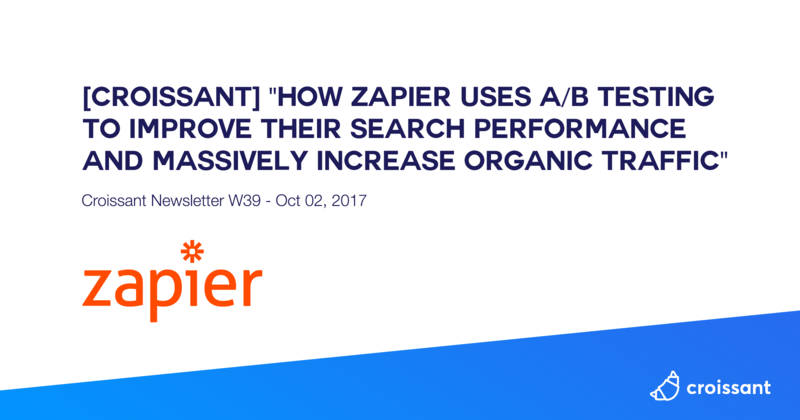 "One way to bring that quantitative rigor to your organic search efforts is to do SEO A/B testing. One SEO test involved putting more text descriptions alongside images, and the positive result led to a series of follow-up experiments that resulted in a nearly 30% increase in traffic in 2014. Small changes can create large and lasting effects." "One of our main goals when building Belfry was to reduce the barrier to entry when it comes to A/B testing. A configurable in-house A/B testing platform allows us to understand our users more than we ever have before with minimal effort. After about four weeks of testing and 40,000 cumulative impressions, we found that our variant, “Provider Tools”, successfully drove 34% more clicks with 99% statistical significance. We were then able to ship the new copy with full confidence that it was the superior option." "Zello’s growth strategy among blue collar workers has been similar to Slack’s growth strategy among white collar workers. While Slack is ideal for workers who sit behind a computer for most of the day, Zello is trying to cater to those who are on the move and need both hands free to do their job. Key Growth Lessons: 1. Group orientation led to faster viral spread. 2. Targeting an underserved market segment allowed them to fill the hole where other apps fell short 3. A bottoms-up sales approach turns individual users into mini-SDRs supporting top-down enterprise sales efforts." "Want to engage your users? 12. Using your product should feel like playing a game! Some of the best apps have successfully used gamiﬁcation for growth. Products are built to fit with channels. Channels do not mold to products.Prioritize the right channels for your product, Don't set targets for a new channel until you have enough data to build a reliable model." "In this article, I’ll be reviewing how Koala DRIVES GROWTH through digital marketing. IMPORTANT: I won’t be going through everything they’re doing online (because there’s a lot). I’ll just be reviewing (what I believe are) their biggest growth drivers – the strategies and tactics that really accelerated their growth. Let’s do this!" "According to SEMRush, Casper ranks for 36.3K keywords on the US market, their largest market by far. In Australia, that number is still high with 4.1k keywords. However, Casper still has huge opportunity for growth with their bi-products. They only rank #30 for “sheets” (135,000 SV) and #48 for “duvet” (60,500 SV). They already rank #6 for “pillows” (40,500 SV) and should follow that example. And even though Casper ranks for a large amount of keywords, most of their higher rankings are related to their product."